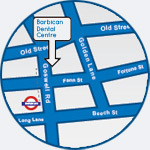 We provide a wide range of high quality private and NHS dental treatments at our Barbican Dental Centre surgery. Please do call if you have any questions. Our team is made up of specialists, dentists, hygienists and nurses. Our practice philosophy is to deliver conservative, minimally invasive procedures. We understand that tooth pain can impact hugely on your daily life and can make nights very difficult. If you have a dental emergency please call us on 0207 253 3232.